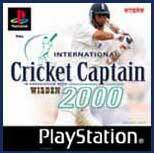 International Cricket Captain 2000 is the Playstation version of the popular PC management game International Cricket Captain 2000.
International Cricket Captain 2000 Playstation version was released in the UK yesterday. Latest news on the expected release date for the Playstation version is July. Created Downloads page - added Empire web pack. Updated Links page - added Link to official Empire International Cricket Captain 2000 site. Updated Screenshots page - added 6 screenshots from Empire web pack. An incorrect Press Release for ICC 2000 (PSX) was released this week. It was released with the development team knowing and should be ignored. A proper Press Release for the PSX version will be made available soon. Updated Links page - added Link to new International Cricket Captain 2000 site by Andrew Garven. Updated Links page - added link to Ken Daniel's ICC 2000 site. Updated Links page - added link to Empire.